↑ 1.0 1.1 1.2 1.3 Sharma, Usha (2008). "Mahalaya". Festivals In Indian Society. 2. Mittal Publications. পৃষ্ঠা. 72–73. ISBN 9788183241137. http://books.google.com/?id=Z6OYRUEAF7oC&pg=PA72&dq=pitru+paksha&q=pitru%20paksha. ↑ 2.0 2.1 2.2 2.3 2.4 2.5 2.6 2.7 2.8 Underhill, M M (2001). The Hindu religious year. Asian Educational Services. পৃষ্ঠা. 112–116. ISBN 9788120605237. http://books.google.com/?id=Fb9Zc0yPVUUC&pg=PA114&dq=mahalaya&q=sraddha. ↑ 3.0 3.1 3.2 Vidyarathi, L P. The Sacred Complex in Hindu Gaya. Concept Publishing Company. পৃষ্ঠা. 13, 15, 33, 81, 110. http://books.google.com/?id=S4FidiusPr0C&pg=PA34&dq=mahalaya&q=mahalaya. ↑ 4.0 4.1 4.2 4.3 4.4 4.5 4.6 4.7 Dilipsingh, K S (2004). Kutch in festival and custom. Har-Anand Publications. পৃষ্ঠা. 61–64. ISBN 9788124109984. http://books.google.com/?id=oPUFiGRH07IC&pg=PA66&dq=pitru+paksha&q=pitru%20paksha. ↑ Sastri, S. M. Natesa (1988). Hindu feasts, fasts and ceremonies. Asian Educational Services. পৃষ্ঠা. 15–17. ISBN 9788120604025. http://books.google.com/?id=_ibsEj8ihuoC&pg=PA15&dq=mahalaya&q=mahalaya. ↑ Chauturvedi, B K (2006). "The Best Charity: Food and water". Tales from the Vedas and other Scriptures. Diamond Pocket Books (P) Ltd.. পৃষ্ঠা. 192–193. ISBN 9788128811999. http://books.google.com/?id=Z8zjLliIBGQC&pg=PA193&dq=pitru+paksha&q=. ↑ Chatterjee, Deepam (18 September 2009). "Speaking Tree: Mahalaya Amavasya & Navaratri: Legend of Karna". The Times of India. http://timesofindia.indiatimes.com/opinion/edit-page/Speaking-Tree-Mahalaya-Amavasya-Navaratri-Legend-of-Karna/articleshow/5023627.cms। আহৰণ কৰা হৈছে: 2009-09-27. ↑ Menon, Usha (2003). "Morality and Context: A Study of Hindu Understandings". In Valsiner, Jaan; Connolly, Kevin J.. Handbook of developmental psychology. SAGE. পৃষ্ঠা. 446. ISBN 9780761962311. http://books.google.com/?id=4d7FOANFv00C&pg=PA446&dq=pitru+paksha&q=. ↑ Sharma, S P; Gupta, Seema (2006). 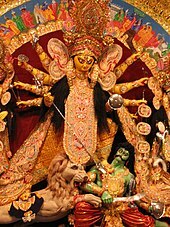 "Durga Puja: Mahalaya". Fairs and Festivals of India. Pustak Mahal. পৃষ্ঠা. 38. ISBN 9788122309515. http://books.google.com/?id=wPPr9HdmnHcC&pg=PA38&dq=mahalaya+Durga+Puja&q=mahalaya%20Durga%20Puja. ↑ TNN (19 September 2009). "Mahalaya ushers in the Puja spirit". The Times of India. http://timesofindia.indiatimes.com/news/city/delhi/Mahalaya-ushers-in-the-Puja-spirit/articleshow/5028658.cms। আহৰণ কৰা হৈছে: 2009-09-27. ↑ Justice, Christopher (1997). Dying the good death: the pilgrimage to die in India's Holy City. SUNY Press. পৃষ্ঠা. 43. ISBN 9780791432617. http://books.google.com/?id=TW4jG0hxHcUC&pg=PA244&dq=pitru+paksha&q=pitri%20paksh. ↑ 12.0 12.1 Bryant, Clifton D. (2003). Handbook of Death and Dying. SAGE. পৃষ্ঠা. 647. ISBN 9780761925149. http://books.google.com/?id=3z9EpgisKOgC&pg=RA1-PA647&dq=pitru+paksha&q=paksha.